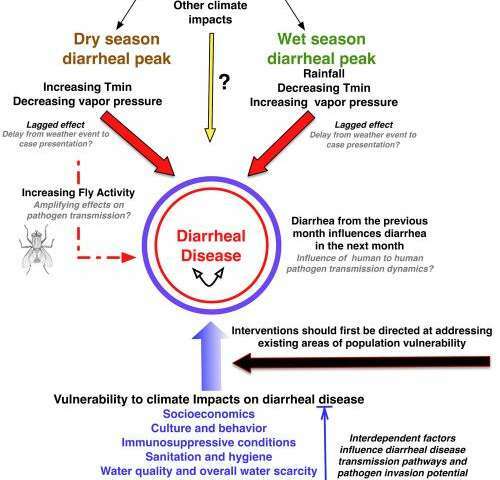 In a National Science Foundation funded study, Kathleen Alexander, an associate professor of wildlife at Virginia Tech, found that climate drives a large part of diarrheal disease and increases the threat of climate change for vulnerable communities. The only study of its kind in Sub-Saharan Africa is based on three decades of historical data and has important implications for arid countries around the world struggling with poverty and increasing health challenges. Alexander, a veterinarian, teaches in Virginia Tech's College of Natural Resources and Environment and conducts research at the Blacksburg, Va., campus and at her nonprofit research center, the Center for African Resources: Animals, Communities, and Land Use(CARACAL), in Chobe, Botswana. Alexander's research study, "Climate Change Is Likely to Worsen the Public Health Threat of Diarrheal Disease in Botswana," was published today (March 26, 2013) in the International Journal of Environmental Research and Public Health. Alexander and colleagues analyzed data on diarrheal disease from 1974, eight years after Botswana gained independence from British rule, through 2003. "Botswana proactively set up a health surveillance program shortly after it became independent. Over such a long time period, however, it was not easy locating all the historical documents pertaining to diarrhea case incidence," Alexander said. "Finding such data in Africa is difficult, and this explains why long-term studies of climate and health interactions are uncommon," she continued. "Our work indicates that there is a critical need to identify climate-health interactions across the continent and develop appropriate adaptive strategies in response." The Botswana Ministry of Health and the Ministry of Environment Wildlife and Tourism provided research assistance. The Wildize Foundation, an African conservation organization, supplemented funding. Researchers Marcos Carzolio and Eric Vance from Virginia Tech and Douglas Goodin from Kansas State University co-authored the study. "Diarrheal disease is an important health challenge, accounting for the majority of childhood deaths globally and the second highest in Botswana," Alexander said. "Our findings suggest that climate change will increase the occurrence of diarrhea and the burden of disease among vulnerable populations in Botswana and similarly affected regions." Botswana is an arid, landlocked country in southern Africa with a subtropical climate of distinct wet and dry seasons. Alexander and her co-authors evaluated monthly reports of diarrheal disease among patients treated at Botswana health facilities since 1974 and compared that data with climatic variables over that same period. "Our analysis suggests that forecasted climate change increases in temperature and decreases in precipitation for the region are likely to increase dry season diarrheal disease incidence, while diarrheal disease incidence in the wet season is likely to decline," Alexander explained. Diarrheal case incidence peaks in both the wet and dry seasons in Botswana with mean case incidence 20 percent higher on average in the dry season over the wet season. "We were not expecting diarrheal disease to be worse in the dry season," Alexander pointed out. "These dry season diarrheal disease peaks occur during the hottest and driest times of the year, conditions that can increase fly activity and density. This is significant, as flies can be important in the transmission of diarrheal-disease-causing microorganisms." Alexander believes flies may provide an important dry season amplifying influence on factors already contributing to diarrheal disease. "It is an important area of research that we will be pursuing," she added. "Our results identify significant climate-health interactions and highlight the need for an escalated public health focus on controlling diarrheal disease in Botswana," she continued. "Understanding the potential health impacts of climate change in low-income countries will be essential to developing mitigation and adaptive strategies designed to protect these vulnerable populations expected to be impacted the hardest but least able to adapt." "While our work identifies important climate-health interactions and increased vulnerability of Botswana to forecasted changes in regional climate," Alexander cautioned, "it is important to remember that this does not account for affects of nonclimatic factors such as future improvements in sanitation infrastructure and hygiene. The impact of forecasted climate change on this disease syndrome is likely to be significantly reduced if present day public health deficiencies are fully identified and addressed." "It is essential, however, that we include affected communities in identifying climate change preparedness," Alexander emphasized. "Lack of sociocultural considerations in public health planning can result in locally applied interventions being nonsustainable." Understanding climate variability as a determinant of infectious disease is increasingly seen as a cornerstone of climate change preparedness and an urgent area of need in Africa and elsewhere around the world. "Much of the threat of climate change on health results from our vulnerabilities to environmental change. These vulnerabilities are primarily associated with the poor, who are most dependent on the environment and least able to adapt to changes in these systems," she explained. "If we address current community health deficiencies now, climate change impacts are not likely to have such important and potentially devastating consequences in the future." Because of the magnitude of Alexander's work in Botswana, she is one of three scholars selected as an African regional expert by the World Health Organization and the Convention on Biological Diversity secretariat to participate in a regional workshop in Mozambique April 2-5. As a specialist in disease ecology with associated ecological and human dimensions, she will make a presentation to leaders from various African countries on integrating health and biodiversity in policy and planning efforts. "Kathy is a brilliant scholar who successfully connects her many skills to people in Botswana," said Paul Winistorfer, dean of Virginia Tech's College of Natural Resources and Environment. "She recognizes that her most important goal is to improve the lives and livelihood of these people, while respecting the human-wildlife interaction that is coupled to environmental sustainability." So this is where the GW Alarmist Turds come from.